Rife with arcane references, unfamiliar expressions, and words of his own invention, Shakespeare's texts can intimidate even the most learned reader. 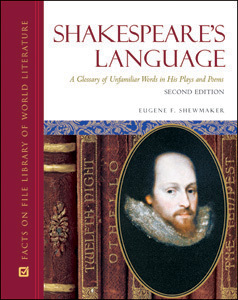 Shakespeare's Language, Second Edition is a comprehensive and straightforward guide to the ornate and sometimes bewildering language that may be unfamiliar to today's readers of Shakespeare's plays and poetry. This revised and updated edition contains approximately 17,000 definitionsmore than 2,000 of which are newfrom the adjective "acerb" in Othello to the verb "zwaggered" in King Lear. It also features an all-new chapter, "Introduction to Shakespeare and His Language," which provides essential background on Shakespeare's life and works, as well as an in-depth discussion of how modern readers can approach his works in order to best understand and enjoy them. Coverage includes geographical references, historical and mythological figures, and foreign-language expressions. "...a useful addition to any literature reference section...Recommended." "Written in an accessible style...useful...Recommended." "Highly recommended for English literature collections." "...a great resource for high school English teachers who teach Shakespeare." "Students and scholars will appreciate the painstaking research that has gone into this volume...offers readers a valuable tool for gaining a fuller appreciation of Shakespeare’s works...a handy, easy to use and affordable resource..."